Developed by an Indian startup company called Uravu Labs, Eva is a device that makes drinking water from the air. Eva provides a source of drinking water where conventional sources such as groundwater and surface water are absent or hard to sustain through the seasons. Uravu has the vision of putting an end to the drinking water crisis, so none would have to walk long miles in the Sun to fetch water. Drinking water supply is also stated in the United Nations Sustainable Development Goals (UNSDG) for 2030. Water from the atmosphere could solve this problem not just for the current population but also for generations to come. Decentralized: It does not rely upon any of existing infrastructure for power or water. So how is Uravu developing a product like this? To briefly describe the premise of this idea, the Earth’s atmosphere contains around ten times the amount of water present in all of the Earth’s rivers put together. In addition to this abundant quantity, it is replenished every 7 to 8 days by the natural water cycle of evaporation and condensation. But with 71% of the Earth’s surface covered with water, why would we tap into the atmosphere to meet our drinking water needs? Multiple reasons have pushed innovators in this direction. To begin with, 96% of this water is saline and needs complex treatment. Specific to India, 70% of all the water supplied in the country is contaminated and does not meet international standards of safe drinking water. Zooming into urban population of India, 100 million in its major cities are affected by this drinking water crisis. 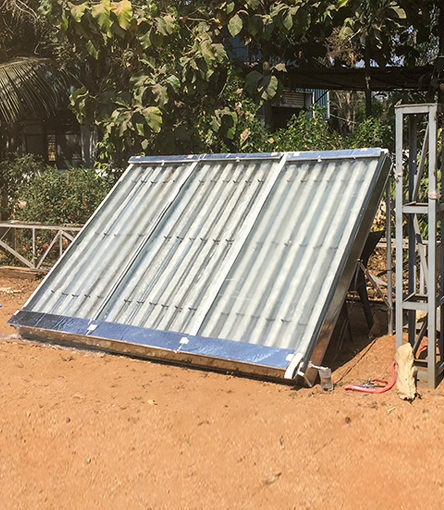 Eva uses a hygroscopic material to convert water vapour into water using solar thermal energy. At night, the hygroscopic material adsorbs water from the air. During the day, water molecules are separated from it by heating, using the Sun’s energy. This results in distilled water, still unfit for human consumption. A cartridge is installed to add minerals and the right pH level to make the water drinkable. This entire mechanism is housed in what Uravu calls an ‘aquapanel’, since it resembles a rooftop solar water heater. The Eva aquapanel is a single off-grid unit of 2.5m x 2.0m x 0.2m. One such unit can provide 20 litres of drinking water everyday, which is sufficient for a family of four people for cooking and drinking purposes. The water produced by EVA is Type-II water as per ASTM D1193 and ISO 3696. In the context of climate change, environmental consciousness is a relevant point of view to judge new innovations from. All thumbs-up to Eva in this regard since it runs entirely on renewable energy. This passive energy design combined with a system that has almost no moving parts means that its operational cost is zero. In addition to these features, this atmospheric water generator has the potential to eradicate bottled water which has been a source of plastic waste for decades all over the world. Keeping up with the age of smart devices, Eva is designed to collect real-time data on parameters such as weather conditions, water production and quality, and rate of usage. Predictive maintenance and remote monitoring are added bonuses since they enable timely replacement of the mineral cartridges and filters. Users will have access to a dashboard online to check all these real-time parameters. User experience is, thus, enhanced with this intelligent platform building. Uravu is currently in the process of developing their first prototype of the Eva aquapanel. 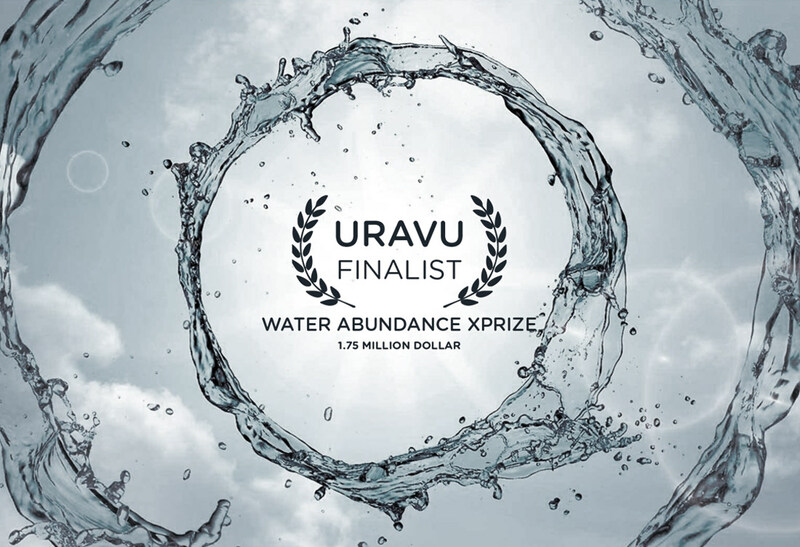 Having signed up to participate in the international competition Water Abundance XPrize, they are among the top 5 finalists from 98 participants, and the only team from India. They received a milestone prize of USD 50,000 in April 2018 which they are using to continue developing the product. Support their crowdfunding campaign on Indiegogo to ensure that Eva makes a big step forward in solving the world’s water crisis.